Looking for the perfect get- away towable? 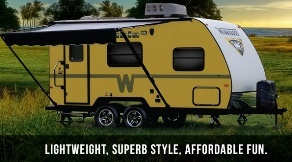 Easy to tow and park, the affordable Winnebago MINNIE has allured attention of many. Offered in bright eye catching colors in Lime, Lemon or maybe you’d prefer a more traditional white. This introductory towable “Minnie” seems anything but mini with its air-conditioning substantial walkable living space! I was surprised by the style and ease of mobility this lightweight towable had to offer. Inside Winnebago has fully loaded the kitchen with a full size double door refrigerator, three burner stove top and range hood, double sink, microwave and large pantry. Impressively it sleeps four including a queen memory foam mattress with overhead storage, stylish solid maple cabinetry and closet space! Outside is just as well equipped with television hookup and bracket, exterior speakers, large patio awning and exterior storage! Winnebago went all out as they do with each of their high quality products, down to their torque windows and dark tinted radius safety glass to keep out heat. Of course they didn’t forget adequate water tanks, AMP convertor and even supplied a convenient full one piece rubber WALKABLE roof, and front diamond plate rock guard that will help maintain your Winnebagos’ high quality materials that make this Minnie built to last. You have to check out our multiple floor-plans and additional options available! !